Toffee is a combination of sugar and butter. The manufacturer melts the sugar and mixes in the butter before allowing the mixture to cool. The calories in toffee come primarily from sugar. This nutritional information applies to a single piece of plain toffee candy weighing about 1/4 oz. 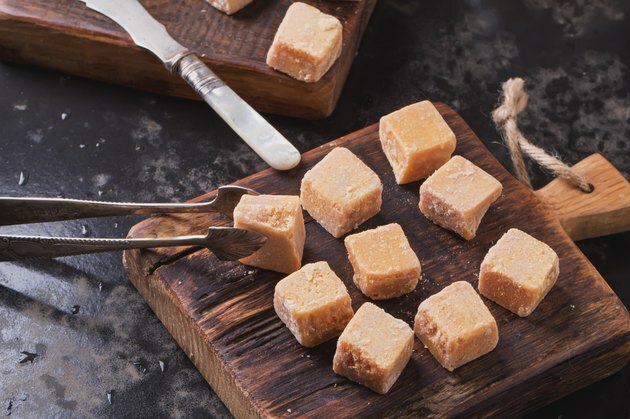 A piece of toffee candy contains about 27 calories, according to Fatsecret. This daily value assumes a standard diet of 2,000 calories per day. The calories in the piece of toffee candy comprise 21 calories from carbohydrates, five calories from fat and one calorie from protein. A piece of toffee candy has 5.47 g in carbohydrates -- about 2 percent of the daily value for carbohydrates. A piece of toffee candy also provides 0.58 g of fat -- about 1 percent of the daily value for fat. The protein content in a piece of toffee candy is 0.33 g -- less than 1 percent of the daily value for protein. A piece of coffee candy contains 4.66 g of sugar, which provides about 19 calories.